Researchers from the Theoretical Physics and Cosmos department of Granada University (UGR, Spain) lead a study which gives new details about the formation process of the structure of our galaxy, the Milky Way.This study is based on data obtained at Calar Alto. Granada University astronomer Isabel Pérez lead a series of observational studies which show the distribution and characteristics of the stars in barred spiral galaxies like the Milky Way, giving new insights on the formation process of this kind of galaxies. A common feature among spiral galaxies is the presence of a bar – an elongated concentration of stars which drives the slow, secular evolution of the galaxy after being formed in violent fusion events of its primordial components. In addition to these elongated structures, some galaxies (incl. the Milky Way) show the so-called boxy/peanut (B/P) bulges at their center, an accumulation of matter having these shapes, depending on the angle from which the galaxy is observed. Numerical simulations suggest that B/P bulges are intimately related to the formation of a bar. During the evolution of a galaxy, material can accumulate in the center to generate an elongated structure. This structure, under adequate conditions, may grow until it turns into a strong bar, suffering a sudden vertical growing -- a phase in the bar evolution well established theoretically, but which still needs a lot of study. The bar will keep evolving radially, giving a central B/P bulge due this sudden vertical growing. During these phases, stars are being formed in different places and move in distinct ways. Consequently, different regions or structures in a given galaxy could have stars with different characteristics. The researchers participating in this project have studied observationally the characteristics and spatial distribution of stars in barred spiral galaxies, key to confirm this scenario and to determine when the bar formed and when the vertical instability occurred. 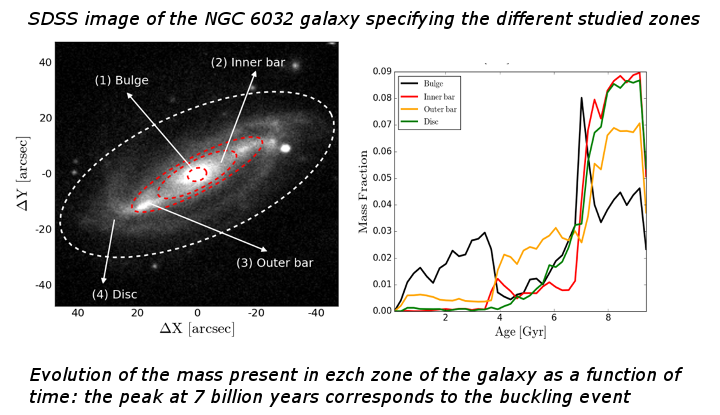 Applying modern spectral analysis techniques to integral fiber unit data from the CALIFA project, performed at Calar Alto, the scientists analyzed the age distribution of stars in the bulge, bar and disk of the spiral galaxy NGC 6032, which shows evidence of a B/P bulge. Comparison between the observational results and modern simulations of barred galaxies, performed by the authors, allowed them to suggest that the bar in NGC 6032 is over ten billion years old, and suffered the vertical instability eight billion years ago. It is the first time that this moment of buckling is observed. In addition, the researchers found evidence that bars grow from the disk material and that they act as “conveyor belts”, sending material from the disk to the central zone without forming stars in them, a pioneer observational result. “All this let us conclude that these curious structures (bars and P/B bulges) are long-lasting. The result is an additional step towards the understanding of how the bulge and the bar formed in the Milky Way” says the PI of the project, Isabel Pérez. This research is published in a letter in the prestigious journal Royal Monthly Notices of the Royal Astronomical Society.